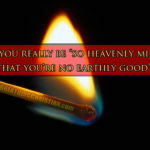 Like any good network marketer or pyramid scheme advocate, the wise American Churchianity religionist knows that the last thing you want to do in the process of courting a potential convert is tell them anything that might make them feel bad about anything – especially about themselves. With that being Rule #1 in purpose-driven zombie evangelism, anything remotely resembling the true Gospel of Christ simply must go. It has no place. Pizza, on the other hand…now that’s a whole ‘nother story. This pizza-over-Gospel approach really does make perfect sense from a purpose-driven perspective. Remember: All unrepentant, rebellious men and women are born at war with God. They hate what He loves and love what He hates. They love the flesh and hate His Spirit. They are zombies. 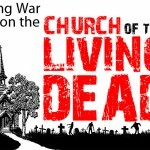 Since the things that appeal to zombies are always distinct from the whole, undiluted Gospel of Jesus Christ, so too then must the evangelical call of American Churchianity also be clear in its separation from the whole, undiluted Gospel of Jesus Christ – at least if the church wishes to keep those numbers growing…and it does…above all else. Numbers are the standard. Popularity the goal. Zombie-appeal is everything. 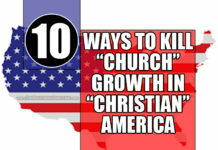 Church growth has become measured in entirely pagan terms. It’s more than content with professions of faith (without expecting a changed life) and pledges of membership (without expecting regular attendance), so long as those precious, all-important numbers are there. Numbers are clearly one of the great idols of the present American church age. 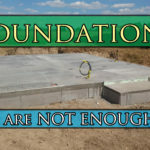 Quantity has completely eclipsed quality in the purpose-driven, man-centered mind of American religious leadership, precisely because the quality standards associated with actual biblical evangelism and Christianity, as defined and explicitly recorded in Scripture, are quite literally unknown and unknowable to zombies – all zombies – be they in the streets, in the pews, or in leadership positions within the organizational machinery of American Christianity. And make no mistake, zombies most certainly permeate all three locations – all by design and, in most cases, to the sheer joy of religious leaders. After all, leadership has a vested interest in preserving the empire it worked so hard to build, and, in order to keep this train a-rolling, the flesh must be fed. This sort of thing is nothing new; it’s happened many times before. It’s the norm in human history. It’s just what fallen men do. It’s the natural, predictable outcome of zombies playing religion. 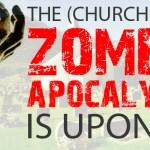 From the first century Christian church to today, all zombie religion roads lead, in some form or fashion, to and through one place, conceptually if not literally. Zombie religion is, has always been, and will always be, about man. Man’s desires, man’s goals, man’s concerns, man’s needs, man’s wants, man’s rules, man’s systems, man’s standards…man, man, man. Ultimately, zombie religion aims to appease man’s conscience by pleasing God just enough to gain His favor using man’s standards of goodness through man-made systems and practices, commonly known as religion. This was true when Jesus lived in Palestine during His earthly ministry and He made war on the dominant religion of the day. It was true when God raised the German Monk Martin Luther roughly 1,500 years later so that he might lead the Reformation against apostate religion that was dominating the world at that time. And it is most certainly true today in the age of American Churchianity. 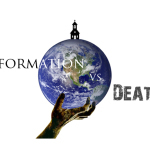 Practically every protestant denomination in America has adopted a very Roman – in the Roman Catholic sense – notion of who God is, who man is, how salvation works, and what it produces when it does work. 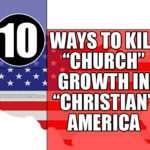 And the supposed Protestants most likely to exhibit this modern day subliminal shift toward Romanism are the common folks who make up the bulk of most congregations – the moms, pops, and kids who occasionally warm the back pews and came in the first place for the programs, socializing, and pizza. They are theologically casual at best. 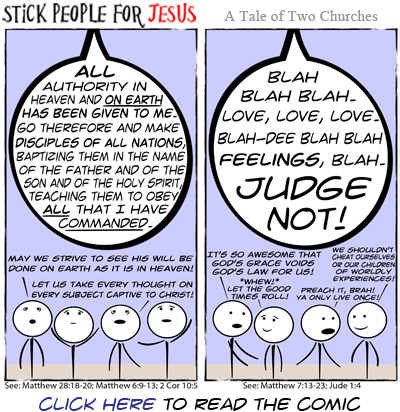 In large part because church leadership is more than happy to simply tell them what to think, as opposed to insisting that they learn how to search Scripture themselves. They are practically indistinguishable from the world. This because, even if they’ve claimed membership and done the “get saved” thing, they are, in fact, unconverted. They live like the world, think like the world, love what the world loves, and hate what the world hates. Most American protestants live like the world, think like the world, love what the world loves, and hate what the world hates. And they just know they’re saved. 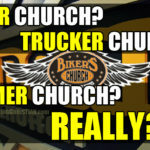 Because their church Father – I mean, Pastor – told them so. 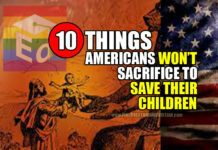 They barely, if ever, read their Bible, and feel no need to do so. They have little or no interest in right theology or doctrine. They are happy to go with the flow of the world. And they are depending on what their church father/pastor/system has told them in order to perpetuate the self-delusion of their own salvation. It’s hard to get more Roman than that. 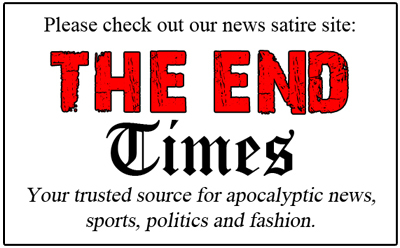 Zombies are to hear little or nothing the biblical concept of sin, much less the word itself. It might hurt their feelings, and we can’t have that. 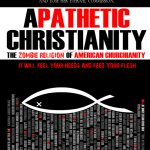 Zombies are to be protected from the notion that Christianity actually requires anything measurable from them (other than “tithing”, of course). Zombies are to be shown – ideally via colorful bulletin boards and posters – the plethora of wonderful programs, ministries, basketball leagues, pot lucks, fishing trips, BBQs, movie nights, summer camps, winter retreats, bowling leagues, hunting trips, breakfast groups, water park visits, hiking trips, reading groups, car clubs, financial seminars, and any number of other creative “need meeting” ideas dreamt up by the church staff, through which said zombies can entertain, satisfy, and/or distract themselves as they see fit. Zombies are to constantly have impressed upon them how easy it is to join the Christian club. They are to be asked important theological questions like “Got Jesus?” by way of t-shirt, poster, and bumper sticker at every opportunity. With the seeker sensitive stage and mood set, it’s showtime! 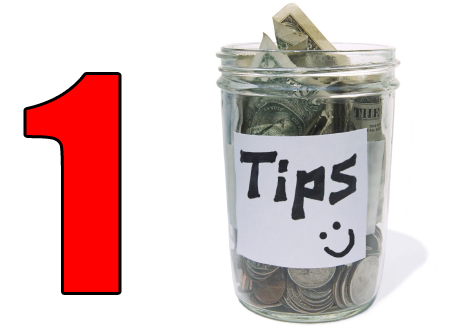 It’ll just take two minutes, tops, so don’t sweat it. And you won’t have to sweat anything after those two minutes are properly spent, so how can you resist?! I mean, it’s like: Free Heaven! That one’s pretty much a no-brainer for the garden variety American zombie. 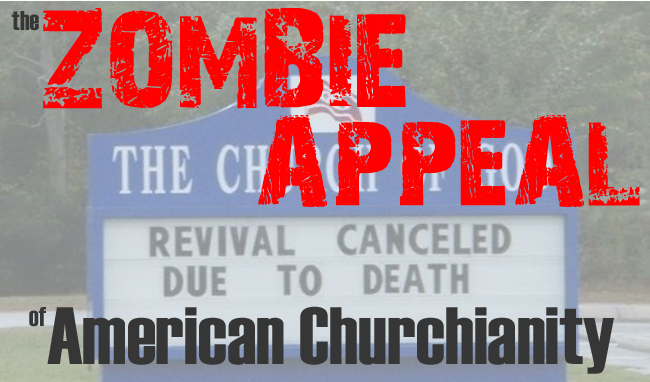 So there you have it – another fish-in-the-barrel easy score for Pastor Feelgood and the McGospel Product of American Churchianity, another zombie expecting Heaven but destined for Hell, and another tallied member for the Church of the Living Dead. 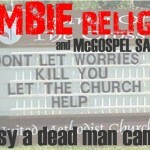 Zombie Religion and McGospel Salvation: So easy a dead man can do it. 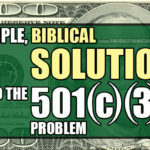 A simple, foolproof solution to the 501(c)(3) church problem. On October 31, are we walking dead or are we supernatural reformers? 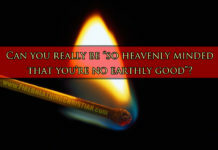 Is it really possible to be “too heavenly minded to be any earthly good”? 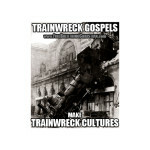 Previous articleZombie Religion and McGospel Salvation: So easy a dead man can do it.